I installed a ColorWare Grip on my iPad earlier. It's lovely: milled from solid aluminum and surprisingly comfortable to use one-handed. I intended to write a cheery post about it until I saw the price: $300. Is that a joke? "Hey, it's Rosa from Gizmodo. I just have a quick question about the Grip." I called ColorWare and asked about the price repeatedly. Did those silly people try to pull a prank on me and send me an altered press release with the product? "The press kit claims that it's $300. Is that really true?" Yep. The Grip really costs $300. According to Colorware, the highly involved creation and quality control process makes it worth every penny. Don't get me wrong, I appreciate careful attention to detail, aircraft-grade materials, perfectly measured fit, and flawless custom paint jobs. And I really like the fact that the Grip finally gives me a way to hold my iPad one-handed without worrying that it'll slip out of my hand—but we're talking about $300 here. Quality product or not, that's a bit much for an accessory—especially considering that the product it's for costs $500. 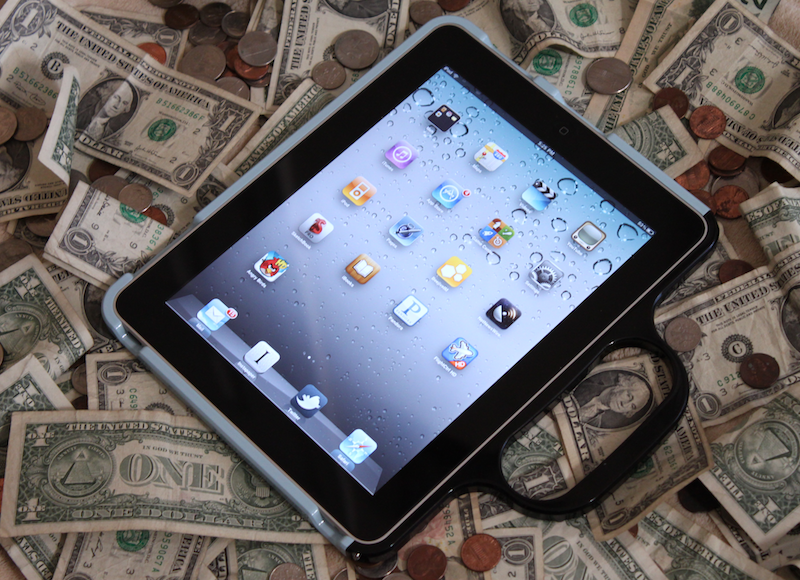 On average, iPad cases run in the $30 to $60 range. The exceptions to that are higher-end ruggedized, custom handmade, and insanely expensive designer cases. Keeping those products and price ranges in mind, I'd say that a somewhat reasonable price point for the Grip would be around $100. After all, it is a decent product. Aside from its seriously solid design—I'm pretty sure it would win a battle against my wall without a scratch—it provides a few new holding positions for the iPad. I instantly fell in love with the sudden freedom to securely hold my iPad in one hand—like a palette—without worrying that it'll slip out of my fingers or needing something to rest my tired hand against. As much as I adore the Grip and how it helps me hold my iPad, I'm truly struggling to recommend it to anyone except to folks who use $100 bills to light their imported cigars while paying someone to hold their iPads for them instead of using a dock. Some people might disagree, of course, and I won't hold it against them. Just like I don't hold anything against my ColorWare contact over the fact that his voice had a tinge of awe when he shared that despite the Grip's order page just barely having gone live, someone had already ordered one. He sounded more surprised than I felt. Ah well. Good luck to the guy or gal who placed that order. I'm sure you'll like your new toy. Here are the assembly instructions for it—you can forward them to your butler or something.